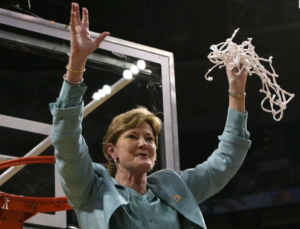 Bob kicks of the second season of the podcast with a welcome and a tribute to the leadership of Lady Vols basketball coach Pat Summitt who passed away this summer. Summit was the winningest coach man or woman at the division one level. She took over the team in 1976 at the age of 22. She went on to win eight national titles, appear in 18 Final Fours, and 1,098 games. More important numbers include the number of ladies that wore the orange as players she coached: 161. Of these, 48 became coaches of their own programs. Even though she had the “death ray stare” that intimidated some, she exhibited the traits of a transformational leader. She showed individual consideration for her players in spite of the tough love by realizing the unique value each had. She encouraged intellectual stimulation by asking her players to be innovative and try new things. She was inspirational and charismatic as she encouraged the Lady Vols to be positive in their attitude and believe in themselves. She also preached commitment and dedication, preparing for what comes next, and goal setting. It's all about perception — and if teammates find you the least bit inconsistent, moody, unpredictable, indecisive or emotionally unreliable, then they balk and the whole team is destabilized. Most young people are all the things I just listed, and [she] was no different. If there is a single ingredient in leadership, it's emotional maturity. Over the next two seasons, I intentionally did everything I could to break [her] down. Why? Because until she completely surrendered herself and her ego, she wasn't going to become the reliable leader we needed. A willingness to do whatever it is that needs to be done regardless of self-interest is the hallmark of a mature leader.